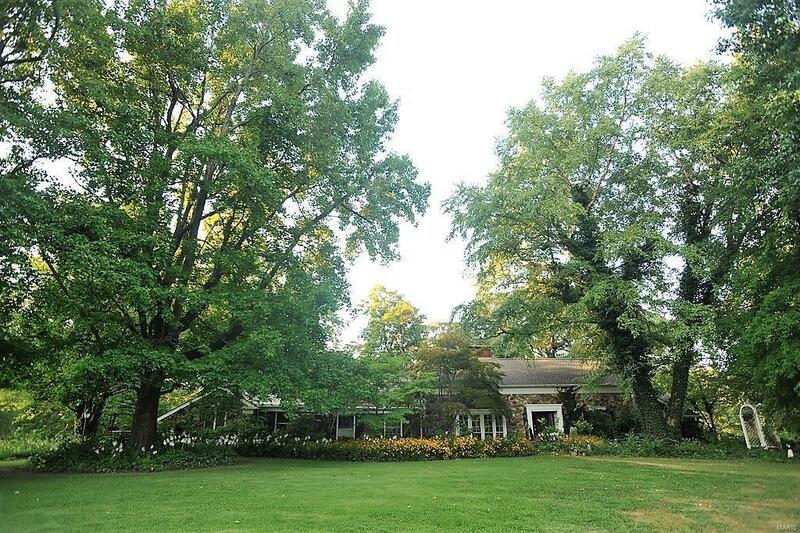 BEAUTIFUL 4.2 Acre Estate, On Lake, including stone ranch home w/ finished basement, stone cottage (possible home office building), green house (possible storage outbuilding), paver patios, walkways, trex dock & its own bridge over the lake! Recessed living room w/ gas fireplace & large bay window. Family room w/ vaulted ceilings, floor to ceiling stone gas fireplace, built-in bookcases & sliding doors to outdoor patios. Combined kitchen & breakfast area w/ white cabinetry, appliances & tiled counters. Dining room is open to kitchen. Master bedroom suite including master bath, second & third bedrooms & full bath. Back hallway includes laundry room & half bath. Lower level w/ recreation room, family room, storage / workroom & cedar closet. "HAVE TO SEE" adorable cottage w/ family room, work room, lofted fourth bedroom & full bathroom. Beautiful acreage, private, rural feel & close to everything including the new Memorial and St. Elizabeth's hospitals, schools, shopping & entertainment!